Card photographs were as ubiquitous in the second half of the nineteenth century as camera phone and Instagram images are today. Primarily albumen prints mounted on card stock, card photos varied in several sizes. First came the carte de visite, French for “visiting card,” in the 1860s. Measuring 2½ x 4 inches, cartes de visite, or CDVs for short, took America by storm and created the world’s first photography craze. For the first time since the introduction of photography in 1839, portrait photographs were available to all classes as they were cheap to make, could be easily copied and sent through the mail without threat of damage. In fact, so many CDVs were sent through the mail as men were off fighting the Civil War, that the US government put a tax on them to help fund the war. Cabinet cards were a larger version of the CDV, measuring 4¼ by 6½ inches and became very popular after 1870. The larger size allowed for greater decoration of the card mounts which advertised the photographer’s name and address. Gradually the mount designs, known as backmarks, grew larger and more ornate, often including many decorative elements common to Victorian design. Popular motifs included painter’s palettes and brushes with cameras to imply the association of photography with fine art, and the sun to symbolize the photographer’s dependence on light. 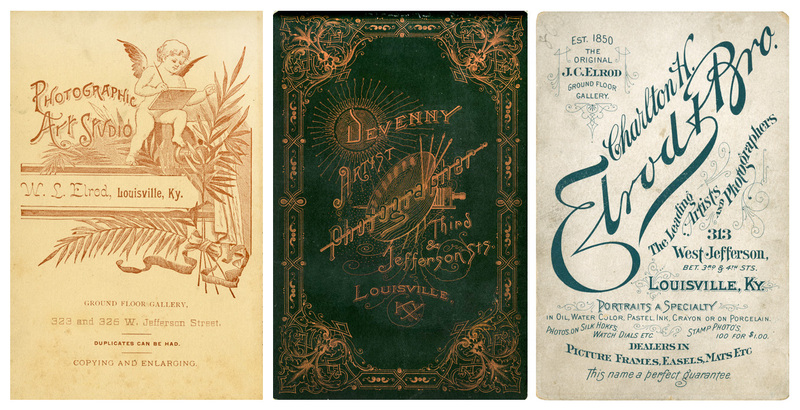 Gilded borders, scalloped edges, colorful mounts and inks, patterned backgrounds, and highly stylized typography all appeared on the mounts of cartes de visite and cabinet card photographs. 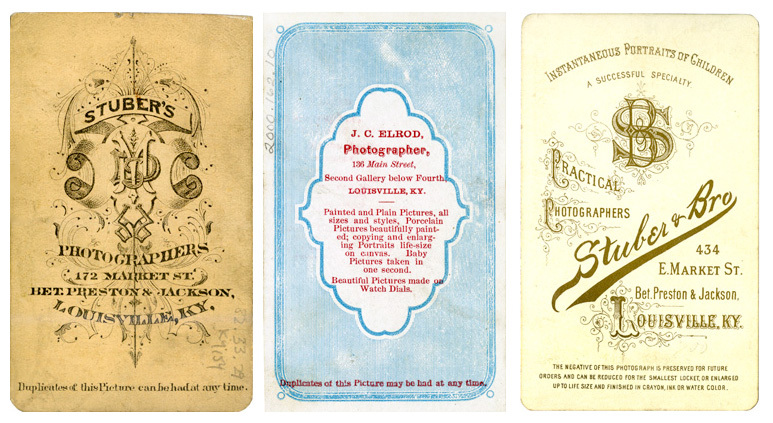 Some photographers hired artists to create original designs for their card mounts, but the majority chose designs from catalogs of photo supply companies. 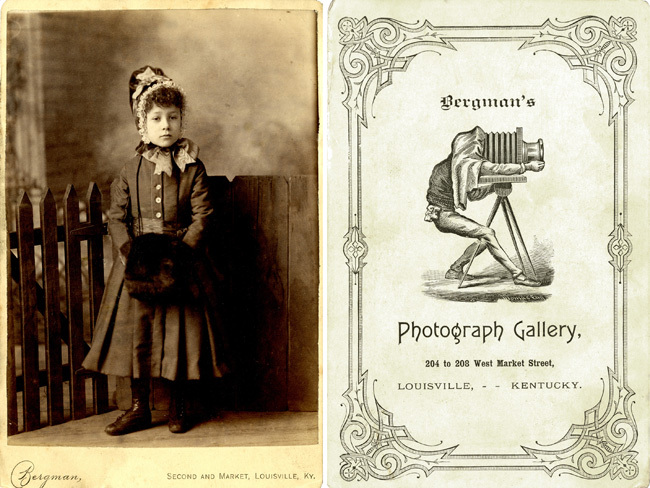 As a result, many studios from around the country produced card photographs with similar mount designs and backmarks. Card photographs orphaned by their original owners and descendants that can today be found in thrift stores and flea markets may no longer hold the identity of the person pictured, but they can still be admired for their beauty and what they reveal about larger trends in Victorian culture, photography and graphic design. 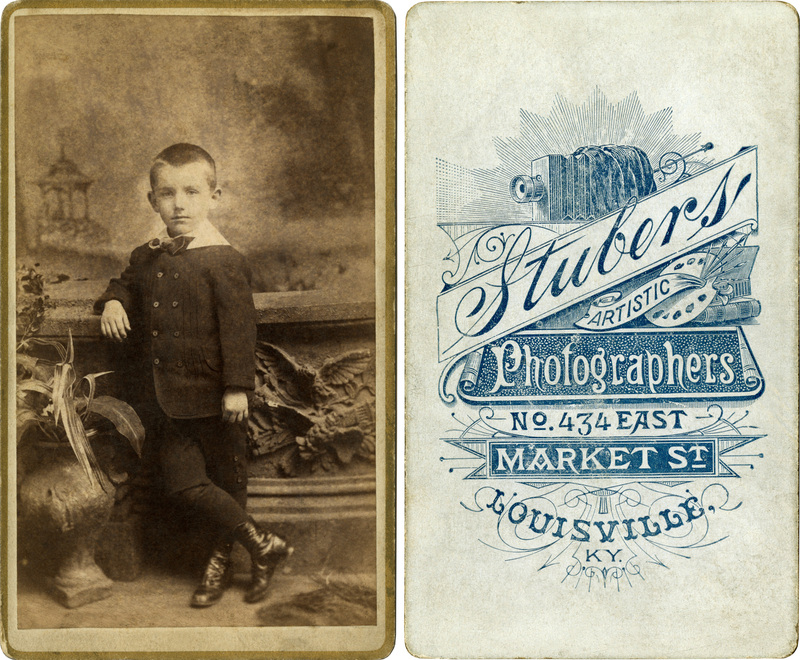 To see many more nineteenth century card photographs created in Louisville, visit the exhibit “Under the Skylight: Louisville’s Nineteenth Century Portrait Studios” in the Photographic Archives gallery from October 10 – November 1.